There are no messages on drarindamghosh's profile yet. 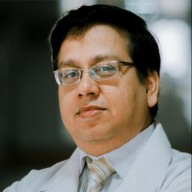 Dr. Arindam Ghosh Established 1st superspecialist GI surgery unit in DMCH Ludhiana. Largest experience of advanced laparoscopic digestive cancer in North India. Established bariatric surgery program in SPS Hospital since 2005 & have successfully completed 1000 BARIATRIC SURGERIES. Doing Sleeves Gastrectomy Gastric Bypass & DIABETIC SURGERY. ESTABLISHED LIVER TRANSPLANT UNIT AT SPS HOSPITAL LUDHIANA.